There are plenty of carpets to choose from, so it can be difficult to make a decision on what type of carpet is best for your home. From nylon, to olefin, polyester and wool, there are plenty of choices that can fit the different types of homes/ apartments/ condos out there. Out of all the types of carpet there are, certain types, based on the fiber and construction, are easier to clean and maintain than other carpets. So, depending on how much time you have, what style you’re looking for and what feel you want under your feet, you should choose a carpet that covers your needs/wants. Nylon: This is the most popular type of carpet fiber to get, and rightfully so. It’s a bit more expensive than the other types of fibers, but it is highly resistant to mildew and does well in high traffic areas. Nylon is more resistant to the wear and tear of everyday life and does well with the weight and movement of furniture. It’s a durable fiber that works for the everyday family. Polyester: This fiber is stain-resistant to a variety of water-soluble stains, and can be easily cleaned. The down side is that it doesn’t do as well as the other carpets with the wear and tear. For those thinking “green,” this carpet may be the perfect choice since some polyester carpet is made from recycled soda bottles. Olefin (polypropylene): This type of carpet is good at resisting stains, moisture, color fading and abrading. It is also attracted to oily soils. This type of fiber may be a perfect option for a playroom or basement because of its resistance to moisture. Wool: This type of fiber gives off the feel of luxury, and so does its price. 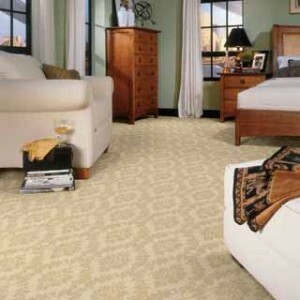 The price tag matches the performances, as this is a good all-around carpet fiber. Wool is resilient to high-traffic, wear-and-tear, while being soft for your feet. The only downsides are that the wool doesn’t do well with stains and turns a yellow color when left in direct sunlight for long periods of time.